Your pet rat deserves the best care, and that means giving him the best rat treats on the market. But there are a lot to choose from, and it can be hard to choose a quality treat. Picking one of these top rat treats can give your rat what he needs, and can keep him happy and healthy at the same time. Before you look at some of the top treats for rats, you should consider what makes a good rat treat. First, there’s nutritional value. You don’t want a rat treat that can cause harm to your pet. Instead, you should feed him something that can give him vitamins or minerals. He might be missing some of them in his regular diet. You should definitely avoid treats with harmful ingredients, like corn kernels or licorice. Most rats will eat almost anything, so you need to be careful what you put in front of them. When choosing a treat, you need to consider your rat’s diet. Is he getting too much protein? If so, that can be detrimental to his health. In that case, you shouldn’t get a rat treat that contains protein. Giving him the treat would only make matters worse. Similarly, consider how often you give your rat fruits and vegetables. If he’s not getting them two or three times a week, you can make up for that with a fruit or vegetable-based treat. It’s also important to find a treat that your rat likes. While you want it to be nutritional, you don’t want it to have no flavor to it. You should shop around for the best rat treats with tasty ingredients. A treat that lacks flavor won’t do you any good. Your pet won’t be interested in eating it, and it won’t motivate him to train or play. But you can use a treat with good flavor as a training tool, or as a way to get your rat moving. And finally, you should look for a rat treat that gives you good value. Although price shouldn’t be your only focus, you should consider the value of your rat treats. If your rat likes them, you’ll need to buy the treats often. So consider whether the price of the treats is worth it. Think about how many treats come in one package and how many treats you might use in a day. Vitakraft Vita Prima Banana Coconut Trail Mix Treat 5 oz. Rat treats don’t come in one specific form or type. There are a variety of different treats that your pet may enjoy. Rice cereal, dog biscuits, chicken bones, and cheese are all possible at-home treats. But if you’re looking for products that you can buy in a store, there are even more options. 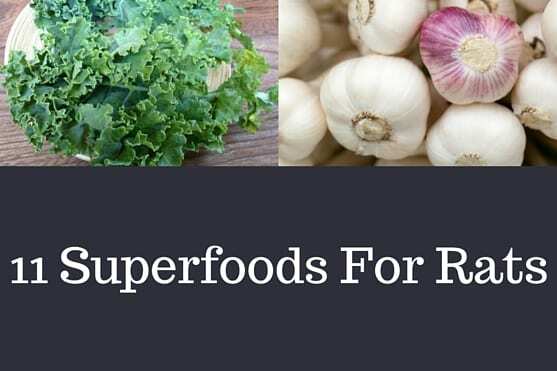 The products often include several ingredients that are great for your rat’s health. They also usually have flavors that most pet rats would find appealing. Your rat treats may not even be labeled for rats. Many small animal treats are suitable for them, but you wouldn’t realize it unless you read the fine print. Other treats are made specifically for rats, and explicitly say “for rats.” It doesn’t mean that one type is better than the other. However, it does mean that you need to look carefully to find the best rat treats. A treat that a company made for guinea pigs may also be an option for your rat. By the same token, not all small animal treats are right for rats. Even with a background about rat treats, choosing the perfect one for your rat can seem difficult. To make the decision easier, here are ten of the best rat treats available. Kaytee Fiesta is a popular brand for owners of small animals. They make a variety of meal and treat options for gerbils, guinea pigs, rats, and other small mammals. In addition to providing a wide range of options, they also offer affordable prices. These treats contain yogurt, which is great for rats. The probiotics in yogurt helps their digestion systems to function well. Keep in mind that these treats don’t contain actual blueberries. They do, however, have blueberry flavoring. That makes them more enjoyable for your pet. And it also makes these treats a great option as a reward for training. The outside of Kaytee Fiesta yogurt treats is hard and crunchy. 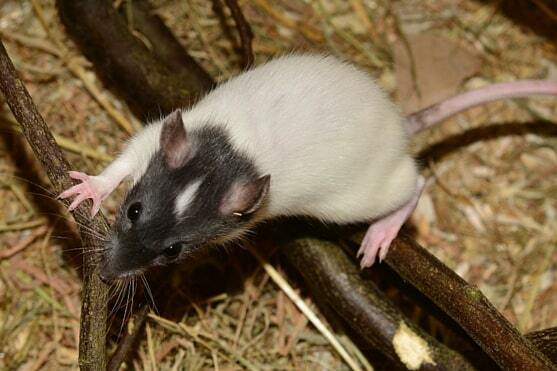 Rats usually enjoy biting into the ball-shaped treat and the crunchy exterior helps them wear down their teeth. Once they get to the inside, they’re met with a soft inner-layer. It’s very different from regular rat food, which adds some great variety to your rat’s diet. Although this treat was created for small animals in general, it’s the perfect size for rats. Approximately the size of a blueberry, these treats are easy for rats to eat. They won’t have a hard time chewing on them, but they also won’t go through them too quickly. Living World is a pet supply company that creates many different pet products. One area of focus for the company is small animals. They don’t just sell habitats, shelters, and wood shavings for small mammals. They also make pet food and pet treats. And their products have been tried and tested. Many of their small animal foods have been met with great success. For the most part, their reviews are positive. 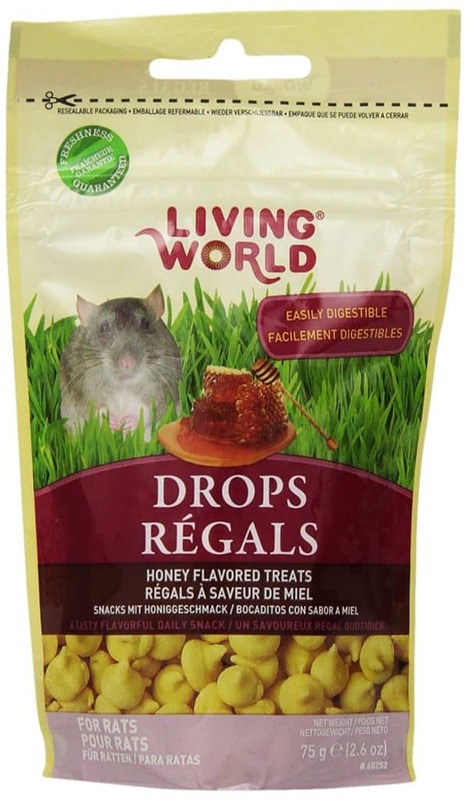 Living World makes treats are specifically for rats. Their Drops for rats come in a variety of flavors, but the honey is a big favorite for many household pets. 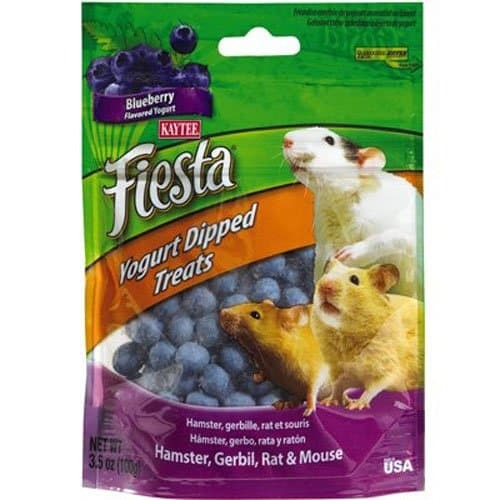 With a base of dried yogurt, these treats are great for your rat’s digestive system. They also contain whey protein, sugar, and several necessary minerals. If you’re looking to add some much needed nutrition to your rat’s diet, these drops are a suitable option. With a strong flavor, these drops can quickly become your rat’s favorite treat. You can give them out daily, although you should limit your rat to two in one day. If you’re working on training your pet, you can use these drops as a reward. Or, place them in a treat ball for a fun enrichment activity. They’re even small enough that you can hide them throughout your rat’s cage. It gives your rat a chance to work on his foraging skills. Ware Manufacturing might not be a common name in your household, but they’ve been in the pet industry for years. They sell products for almost any pet you can imagine, including small animals. Whether you’re looking for a dog house or the best rat treats, Ware Manufacturing has something for you. One of the many products Ware Manufacturing sells is Rice Pops. Their Rice Pops for Small Animals come in different sizes to suit different pets. But for rats, the small treat is ideal. 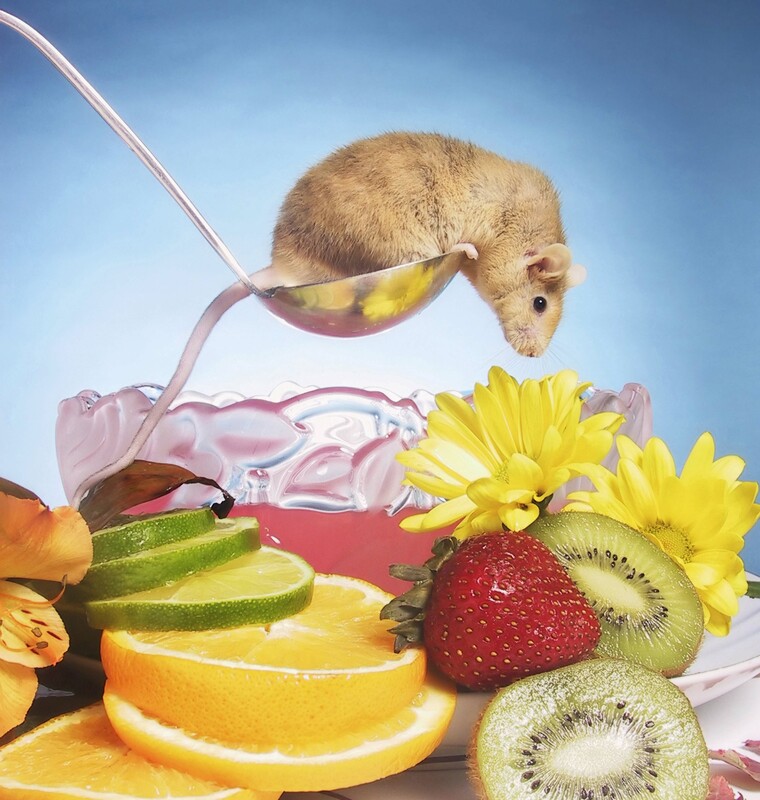 The treats use several healthy and flavorful ingredients for your rat. 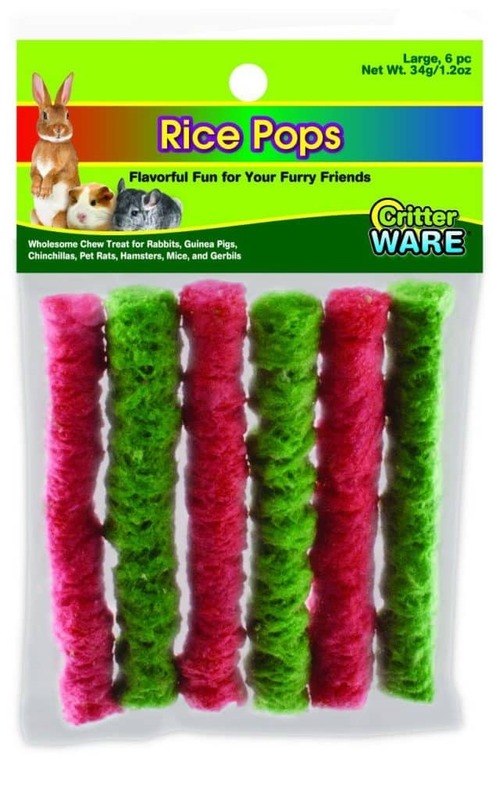 The bright colors (green and pink) engage pets and the treats are the perfect size for pets to nudge and drag. This treat is more about providing entertainment for your pet than it is form providing nutritional value. The treats are large enough for your rat to spend quite a bit of time eating them. As a result, it can fight off boredom. You can hand feed the rice pops to your rat or leave them in his cage. If you buy Ware Manufacturing’s treat dispenser, you can store the treats on it. This gives your rat an opportunity to play while he eats. And, no matter how you give him the treat, it cleans his teeth. They are crunchy enough to provide a much-needed teeth cleaning and a satisfying crunch. F.M Brown’s is a Pennsylvania-based company that caters to birds, horses, small animals, and more. Founded in the 1800s, the company has been providing animal care products for over a century. One of the company’s strongest selling points is that they source clean and healthy ingredients for all their products. Their small animal treats are no exception. In fact, F.M Brown’s makes one of the best rat treats with nutritional value. 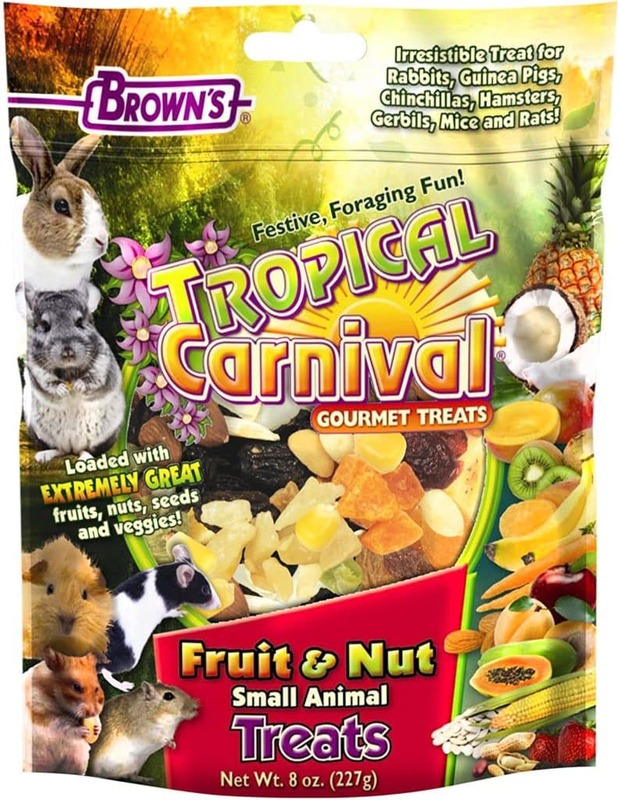 Rat owners who are interested in a healthy treat option should check out FM Brown’s Tropical Carnival Fruit and Nut treat for small animals. This product isn’t loaded with artificial chemicals. Instead, it’s made with real fruit, nuts, and vegetables. It has many of the key ingredients that most rats love. The long list includes papaya, raisins, almonds, and kiwi. Everything is a small size. Making it easy for your rat to eat. And the size of the treats also makes them the ideal fit for enrichment activities. You can put them in enrichment balls or scatter them throughout your rat’s cage. Because they’re so healthy, you don’t need to worry about strictly limiting the amount you give him. They are guilt-free, tasty treats. eCotrition is a company that has dedicated itself to making food for birds and small animals. But it has some very specific goals. The company claims that its mission is to make products that promote a long and healthy life for your pets. They make cage accessories, toys, and treats that all aim to give your pet a better and longer life. What rat doesn’t like the taste of cheese? 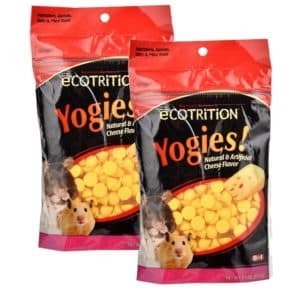 eCotrition made these treats in cheese flavor to make sure your small mammal loves the taste. The treats are small and come in easy to open packaging that you can reseal. Healthy enough to be a daily treat, you can use these yogies as a training aid. They also contain some supplements that can boost your rat’s diet. Also created by F.M Brown’s, these treats are a little different from the fruit and nut blend. 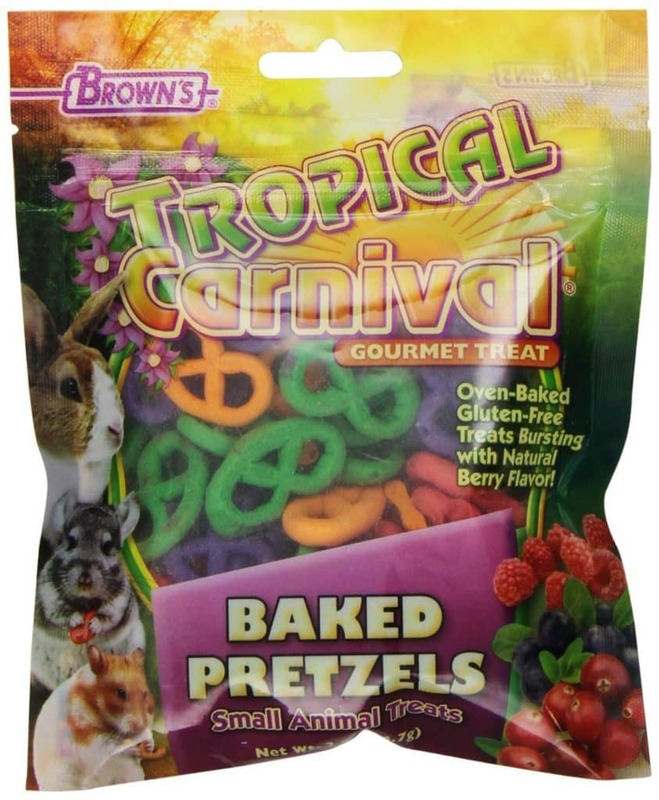 With bright, fun colors, these baked pretzel treats add some excitement to your rat’s day. 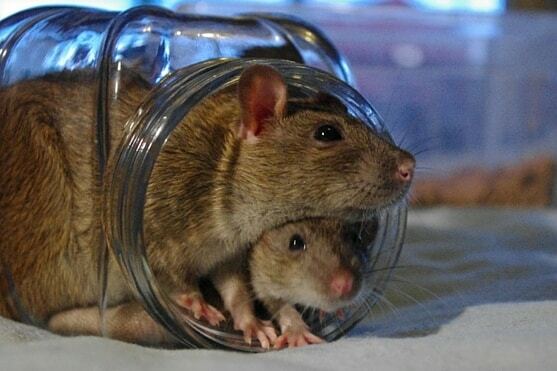 The size and shape makes it easy for rats to carry them around the cage. And they promote healthy teeth because they require plenty of chewing. Although these treats aren’t quite as natural as the fruit and nut blend, they do still contain quality ingredients. They contain yeast, corn flour, and corn starch, just to name a few ingredients. And their flavor is almost as bright as their color. These berry-flavored treats are a big hit with most rats. Vitakraft is a German pet food and treat manufacturer has been around since 1837. Over the years, their services have spread into other countries. Today, they make pet food and treats for birds, horses, small mammals, dogs, and cats. With so many years of experience, it’s no wonder they make one of the best rat treats. 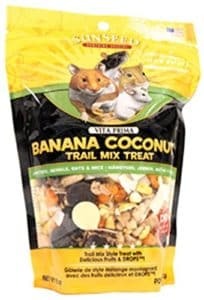 The Prima Banana Coconut Trail Mix Treat is only one of Vitakraft’s treats that works well for rats. The treat is exactly what you might expect- a trail mix for small animals. It features pieces of banana, coconut, carrot, and whole grains. There are carob and yogurt drops scattered throughout the mix. These healthy treats have a high nutritional value and flavor to go along with it. The best rat treats for one rat might not be the best for another. Before you choose your rat’s treat, think about what he likes. Look for a treat in his favorite flavor. You should also consider his dietary needs and if there are any ingredients he should avoid. Finally, look for a treat that fits your needs. 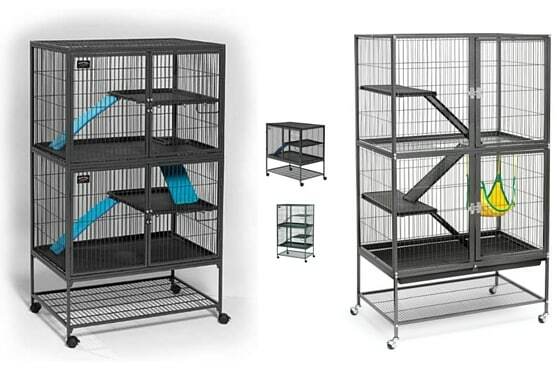 If you plan to use it for training purposes, get one that will motivate your rat. Or, if it’s for enrichment, find a treat the right size for your enrichment activity. Once you go through everything, you can pick a treat that your rat will love.